Thailand's new Premier Surayud Chulanont has said he will use peaceful means to try to resolve the Islamic insurgency in the country's south. The southern violence has claimed more than 1,500 lives since January 2004. Thailand's new rulers have already said they want to hold talks with the insurgents - another policy change from that of Mr Thaksin, whose government repeatedly refused to negotiate. This is Gen Surayud's first official trip to Malaysia since he took office after the 19 September coup. The main topic for discussion was the violence in southern Thailand - an issue which has long been a source of friction between Bangkok and Kuala Lumpur. "I told the Malaysian prime minister that I would talk to the Muslim leaders in the south, to the kids in schools.... That's the way I am trying to present myself - by way of talking," Gen Surayud told reporters after his meeting with his counterpart Abdullah Badawi. He said the two leaders would try "to get in touch personally, and try and find our way through troubled waters in southern Thailand". The people of southern Thailand have much in common with Malaysians, including their Islamic faith and strong ethnic and cultural links. Malaysia's former prime minister, Mahathir Mohamad, has already offered his services and recently met with insurgent leaders. In an interview with the BBC, Dr Mahathir said the rebels "have to accept the fact that they are Thai citizens", although he added that they could request some special consideration because they were not Buddhist Thais. Dr Mahathir held a series of talks with insurgent leaders over the past year, under a peace initiative that was reportedly backed by Thai King Bhumibol Adulyadej. 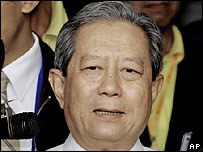 Malaysia recently said it was willing to play a bigger role in the peace process, if asked to do so by Bangkok.